When my dear friend Vickie Howell asked me to be a part of her blog tour to help promote her new line of yarn Sheep(ish) I said "hells to the yes" and then gulped about what I was going to make. My crochet skills are minimal at best and I make clocks out of knitting needles. What was I going to do with yarn? Once I got my hot little hands on a stash and saw all the fabulous colors my mind started churning. Caron sent this cute little embroidery hoop with "yarn swatches" from the line. I kept staring at all the colors and then I started waving the embroidery hoop in front of Baxter and he seemed to enjoy it even more than I did. Clearly I was not going to be whipping up a pair of booties with the yarn so I thought of another way Baxter could enjoy looking at the yarn - a mobile! All I needed was an antler and I was ready to roll. Yup, I said antler. 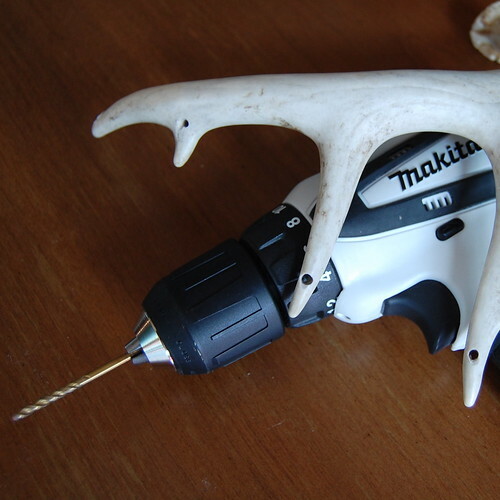 The first thing to do is drill holes in your antler. I recommend doing this outside as it can be kind of stinky. 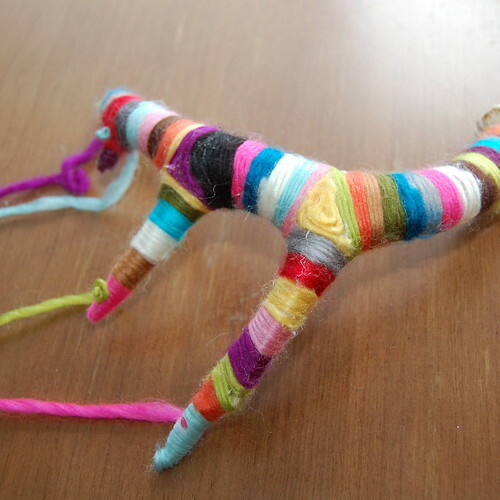 If you have issues with using an antler you could also use a branch. I drilled a hole in each of the points of my antler. 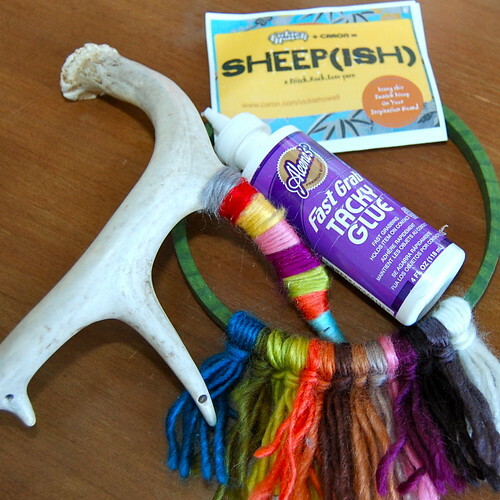 Using the short yarn samples from the embroidery hoop I started wrapping and gluing them to my antler using Aleene's Fast Grab Tacky Glue. 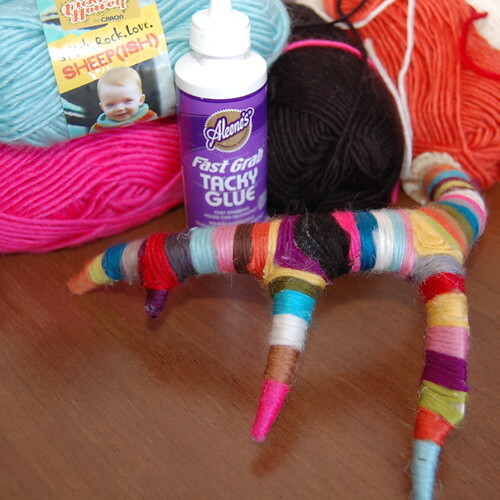 The Fast Grab part is important or you could be holding yarn in place while your glue dries for a very long time. I wrapped and glued and wrapped and glued until my antler was entirely covered with yarn stripes. 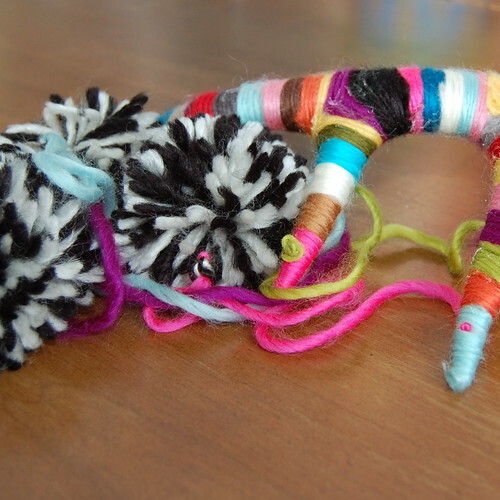 Using black and white Sheep(ish) yarn, a pom pom maker and scissors I made 4 pom poms to hang from the points of my yarn wrapped antler. Using 4 different colors of Sheep(ish) yarn cut at 4 different lengths I strung them through the holes in my antler and tied a knot on the end. I used a large eye plastic needle for stringing. I gotta tell ya at this point I was tempted to just keep this on my kitchen table as a centerpiece it looked so colorful and arty. 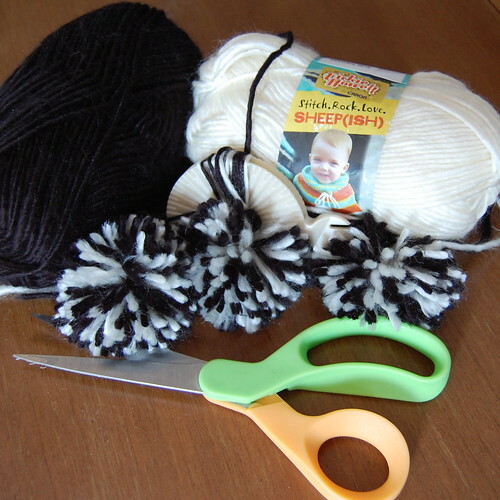 Once my long yarn strings were attached to the mobile I tied them to my black and white pom poms. The last step was to tie some monofilament around my antler so that I could hang it from the ceiling. Baxter seems to enjoy his new mobile and spent a good 15 minutes laying bed looking at it this morning which in baby time is like hours. The Sheep(ish) blog tour continues tomorrow on Craft Zine. 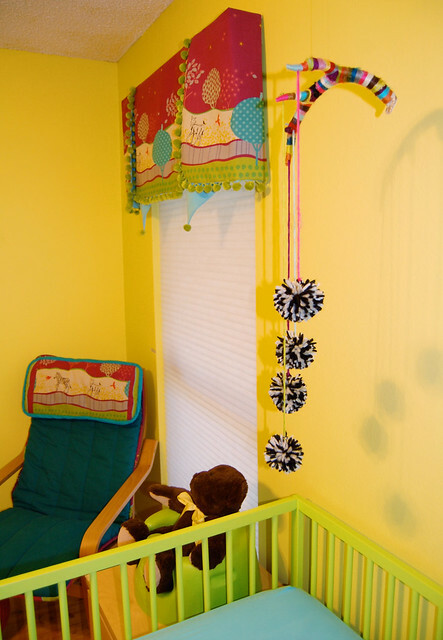 Check out more of my I Love to Create projects here. 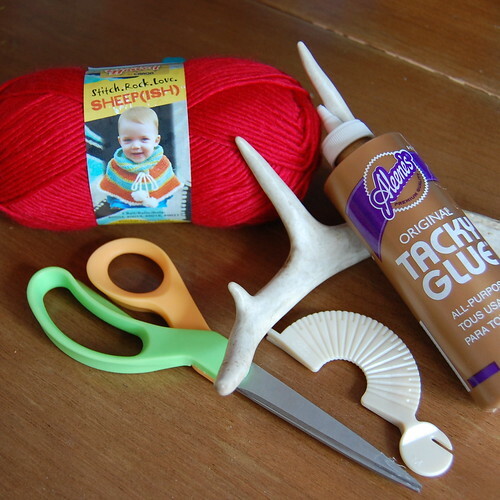 Also check out all these free patterns on Vickie's blog you can make with Sheep(ish).